Inspired by Metro 2033, this mod implements a new resource: gas mask filters. 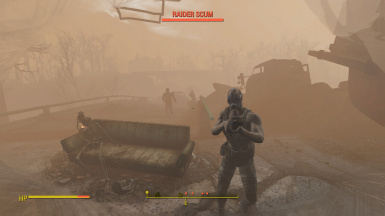 Humans are required to wear a gas mask while wandering the wasteland in exterior areas. Meanwhile gas masks consume filters that keep out harmful radioactive dust. Bug Fix: Fixed the Auto Replace of Used Filters so that they correctly replace with a partially empty filter and consume. Bug Fix: Prevented filters from draining while the weather was pleasant for Rad Only Mode and Precipitation mode. New: Added the [Settings] Gas Mask Holotape and Gas Mask Wipe items to the chem station. - NEW Adjustable Filter Durations in the holotape. You can now set any filter duration. - NEW Options to change radiation levels. 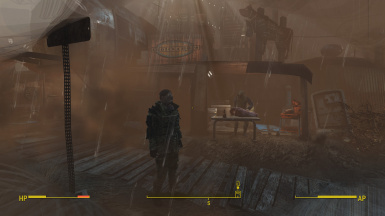 You can change the radiation levels of Pleasant, Cloudy, Rainy, and Dust/Radiation weathers. - Change: Air Filtration System menu redux. - New Destructible Gas Mask system. - New Integrated Metro Gas Masks | Graciously provided by Nutulator, the PPM-88 and the PMK-1 will now spawn on NPCs. These can also be crafted at the chem station. - New Environmental VFX: Blood, Dirt, Dust, Frost | Each of these have toggles in the Holotape Menu. - Bug Fix: Accidental Filter Spam | Filters can now only be consumed under 100 charge to prevent accidental use. - Bug Fix: Prevented filters from draining while in an interior cell. - Bug Fix: prevented coughing from starting during good weather for rad only, precipitation, and no rad mode. - Radiation Weather Only flag added to holotape. 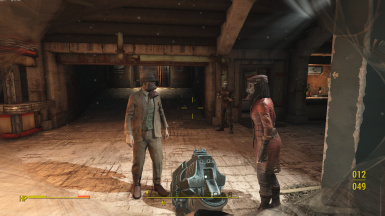 - Changed powerarmor conditions to prevent animations during entrance. Fix: Glass Overlay None option has been fixed to property remove the overlay after reequipping. Fix: Perk requirement for crafting has been fixed. 3rd P assets for gas mask with goggles have been changed. Leveled lists have been changed to a script injector for more compatibility. Filters are more expensive to increase scarsity. Crafting now requires the scrounger perk. Changed the mod activation condition to being outside of pre-war Sanctuary. Children now equip/unequip gas masks. New glass visors have been implemented. Removed the need to download optional compatability patches for armor files. Moved to using a Installer to provide options to the user. 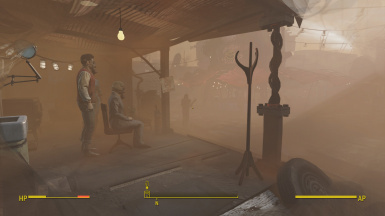 - NEW Air Filtration in Diamond City and Goodneighbor. Players and NPCs do not need to wear a mask in these cities. - NEW Radiated areas tool. Available in the Creation Kit, this allows modders to place down a Hazard radius that will require a gas mask. Gas masks will degrade as the player takes damage. A repair kit can be used outside of combat to repair gas ﻿masks. You can store repair charges (up to 3) by crafting them in the repair kit or spend components to restore the condition of your mask. - Limitations: You may only have 1 instance of each mask (for technical reasons). Example: You cant have two M1A211 gas masks but if you have a armor mod on a mask, they will be considered different masks and have their own condition. 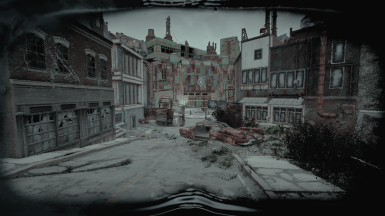 - NEW Added a tutorial for assigning a Gas Mask Vignette (Visor, Lens, One Eye, etc...) to the Destructible Gas Mask System. - NEW Added a Standalone optional download for the M1A211 Gas Mask. - NEW Added a crafting recipe for the M1A211 Gas Mask. - NEW Added the M17 (from Metro Gas Masks) to the leveled lists, it will now appear on NPCs. -Bug Fix: Constant Gas Mask Toggle now appropriately registers if you are in 3rd or 1st person to ensure the overlay is applied appropriately. 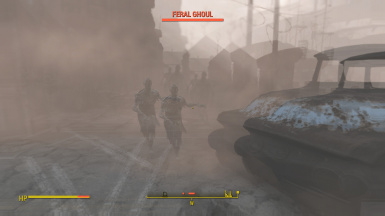 - Bug Fix: HUD Widget displays when the player loads a save. - Change: NPC radiation damage is applied more quickly. - Change: HUD Widget 'Status' no longer displays the filter status, but instead displays the status of your currently equipped mask. - New Integrated Metro Gas Masks (go endorse :) ) | Graciously provided by Nutulator, the PPM-88 and the PMK-1 will now spawn on NPCs. These can also be crafted at the chem station. - New Environmental VFX: Blood, Dirt, Dust, Frost, Mud | Each of these have toggles in the Holotape Menu. - New Wipe Mechanic (Currently During Rain) Option in holotape to disable | Current Known Issues: "flashes" may occur due to the need to turn off the gas mask overlay before some of the rain effects. What happened to some of the cracks on my screen? We found out that only one refraction can be on the screen, so during rain, the rain's refraction has priority. Additional options for holotapes including Drop Rates. Dynamic Duststorm setting that creates storms of changing intensity. Inspired by Metro 2033, this mod implements a new resource, gas mask filters. 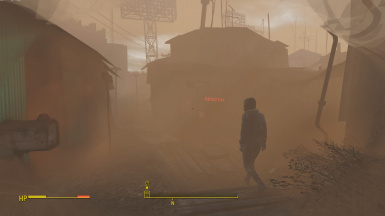 Human NPC's and the player are required to wear a gas mask while wandering in exterior wasteland areas.While equipped, Gas masks consume filters that keep out harmful radiation attached to dust particles in the air. Filters prevent heavy radiation exposure in conjunction with a functioning gas mask. 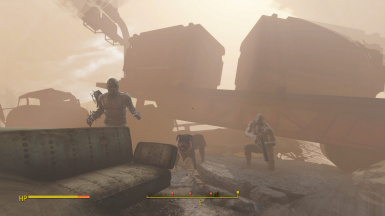 Power armor acts as a gas mask and does not consume filters but instead drains fusion cores. There is a settings holotape. Pretty much any of the features of this mod including those not specified here can be disabled/enabled via the holotape menu. 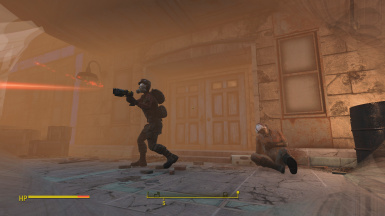 NPC humans remove gas masks on location change if they enter interior areas (normal version) or they remove them in pleasant weather (Precipitation/Rad Weather version). Destructible Gas Masks with degrading glass overlays. 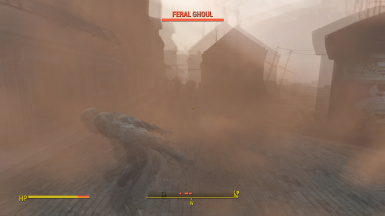 Visual/Sound effects play when the player: Does not have a gas mask on, equips a gas mask, replaces a gas mask filter, or has their gas mask damaged. Audio sliders for SFX in the main audio menu. No overt compatibility issues, but there can be some odd interactions. If you have a previous version: Uninstall the main and all Optional files. We have an installer for NMM users. Core files go into "(...)Steam\SteamApps\common\Fallout 4\Data"
Data files include optional esp files that go into "(...)Steam\SteamApps\common\Fallout 4\Data"
Data\Meshes files include the Glass Overlay files. 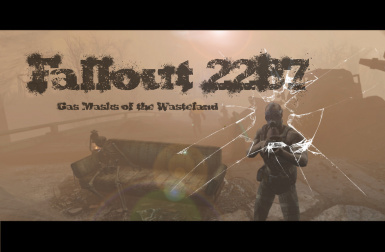 Choose one of the FOV's and copy the lowest overlay folder into "(...)Data\Meshes\FO2287\"
﻿Put Gas Masks of the Wasteland LOW in your order. Do not use LOOT. LOOT prioritizes this mod high in the load order which often causes issues. 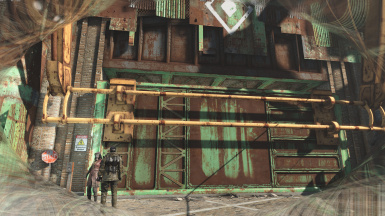 In Vault 111 (at the entrance) and at the Red Rocket station (in garage) I have placed "Survival" Containers that have a supply of Filters and a Gas Mask to get you started. While indoors, filters will not be consumed and bandannas reduce radiation exposure by 75%. If the breathing, filter changing, or other sounds appear too loud, there are sliders in the Audio Menu that to change their volume. Gas mask glass overlay will disappear occasionally. Switching from third person and back to first person resets it. If it does not, try un-equipping and re-equipping your mask. 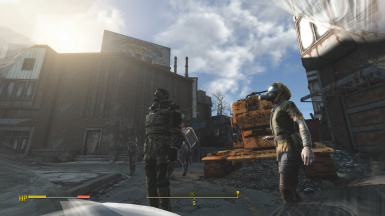 When entering Power Armor while a mask is equipped, it plays the unequip animation. Looking at the pipboy makes the overlay shift upwards, exposing the edge of the texture. Using Pip-Pad will fix it. Not all gas masks are yet animated/implemented. Only the M1A211, Gas Mask with Goggles, and the Raider Gas Mask. Any interruptions like crouching or getting hit during animation removes the annotations, making the animation broken. Stimpack (and possibly other "AnimObject" items) have priority over gas mask, equipping both in pipboy will result in only the stimpack animation being played. When the overlay is on screen, you might see some ghosting, depending on resolution it might be minor or strong. The way that F4 refraction shader works doesn't leave much room for fixing that problem. You can actually see a similar thing when looking at the grenade explosion. We are looking for Animators. Weather mods should be compatible but if you would like it to be consistent, open a weather in the Creation Kit go to the Precipitation and change the Weather Classification flag to an appropriate setting (snow is rad storms). This is my first mod, a way of "breaking" into the scene after being an active user of mods for quite some time. I have aspirations for many mods to come and am looking forward to becoming an active member (assuming time allows). THanks to all our testers who gave great feedback!